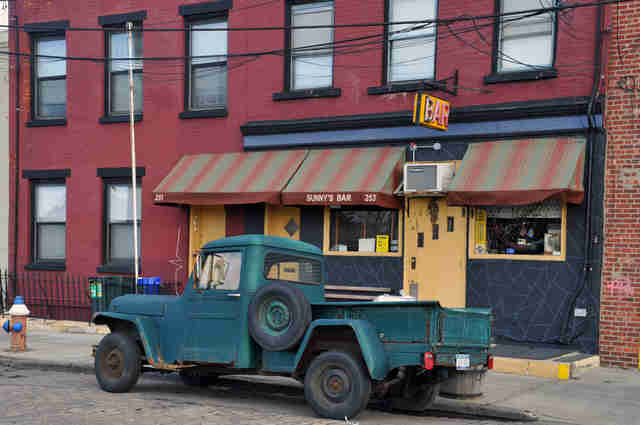 New York City is full of beautiful, fancy places to get your drink on, but when it comes to getting down, dirty, and actually getting a drink that won’t cost you $16, nothing beats a classic dive bar. 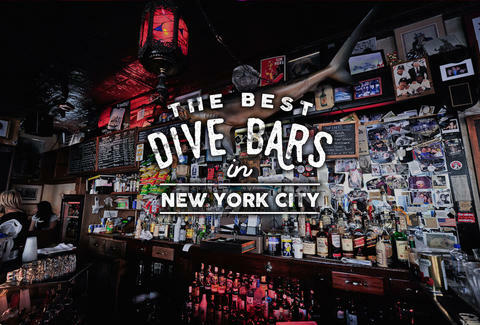 And New York City dives are a breed of their own -- they’re the bars that make even the least neighborhood-y neighborhoods feel like home, where you can always count on cheap booze, bad lighting, a wonderfully surly bartender or two, and at least one guy chugging whiskey at 11am. These are the absolute best dives NYC has to offer. THE Lower East dive bar staple. Charles Hanson’s 169 Soul Jazz Oyster Bar (yes, that is the full name) has basically every random thing you could ever think of, all thrown together seamlessly: good music, oysters, a disco ball, leopard-print pool tables, and pickle martinis (seriously). Craving a taste of the Old West in the middle of Manhattan? Look no further than Doc’s, where the jukebox blasts Johnny Cash and Bud heavys are downed like water. The name pretty much says it all -- this place is rusty, and it likes it that way. Kick back with cheap Caribbean-style cocktails and hang with local patrons at this go-to dive that actually resembles your Grandma’s house in Florida, not a boat. Open daily till 4:00am, Reservoir is a favorite of NYU students and village residents alike, and there are plenty of reasons why -- loads of flat screen TVs, notoriously tasty wings, and classically dim dive lighting. Rumored to be a prohibition speakeasy frequented by Al Capone, everything about Rudy’s is seriously legit. You’re greeted by a 6ft-tall pig (relax, it’s a statue) before entering, and inside there are crazy-cheap brews, whiskey-a-plenty, and free Ball Park Franks. An unassuming nook along Essex St, Beverly’s brings the dive bar charm with kooky neon lighting, slim surroundings, and shots of whiskey for just $6. Sure, you’re not supposed to judge a book by it’s cover. But one look at 7B’s weathered brick exterior, arched doorways, and Tudor-style windows, and you know you’re in for a legendary dive bar. Toss back one of the 31 on-tap brews, blast tunes from the punk rock-heavy jukebox, and take pictures you’ll probably regret the next day in the old-school photo booth. This throwback joint is all about the dive bar essentials -- shooting pool, pounding brews, and doing it all on the cheap. Its slogan is “Shut Up and Drink,” so you know this place is down for a good time. Double’s is a bit of a dump, sure, but with trippy murals, blaring punk rock music, and bacon martinis!!! !, there are plenty of reasons to pitstop here. A Downtown staple for over 40 years, Jeremy’s does its customers right with insanely tasty fried clams, 32oz beers served in Styrofoam cups (for nine bucks! ), and bras casually hanging from the ceiling. It’s been around since 1862, and offers a choice between either “light” or “dark beer.” It’s the king. No further explanation needed. The antidote to UES pretentiousness, Iggy’s is part karaoke hotspot, part dive bar mecca, with a 100ft long bar, loads of flat screen TVs, 24 beers on tap, and riotous singalongs that everyone gets into. Open bright and early at 8am, this beloved neighborhood dive has a great craft beer selection, an always-diverse crowd, and free beer-braised hot dogs on Wednesdays. Also, people used to called it “Shark Bar”... which is just pretty great. After nearly 60 years in business, Holland Bar has become an NYC time capsule, with pictures of regulars and newspaper clippings lining the dark and well-worn walls. But beyond the aesthetics, Holland is simply a good old-fashioned watering hole with a laid back clientele and a reliable assortment of brews. A true throwback to the days before glitzy, shiny establishments were an everyday occurrence, Rosemary’s stays authentic to it’s dive bar roots with year-round Christmas lights, cozy red leather booths, and daily $3 drink specials from 3-7pm. 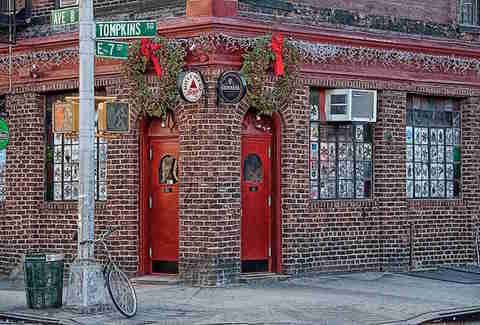 Around since the 1890s, this unassuming bar is the ideal spot to hang out, kick back, and grab a cold one in Red Hook. 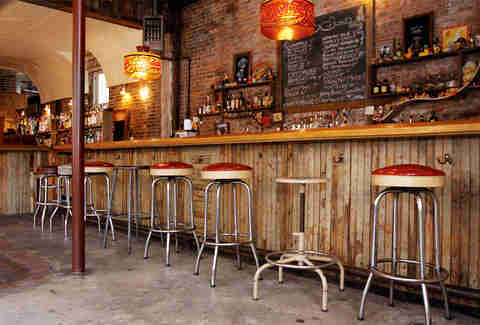 There’s regular live music, a devoted clientele, and bartenders who’ll happily listen to your real or imaginary woes. In business since the 1880s, nostalgia runs deep at this Nolita dive. The booze is good, the service is friendly, and with a litany of patron photos, movie posters, and Sinatra memorabilia lining the walls, it’s the perfect snug spot to grab a low-key drink. The Library’s a classic, old, very dirty (in the best possibly way) neighborhood bar with projectors showing old VHS tapes, a two-for-one happy hour, and the greatest jukebox in all of New York City. 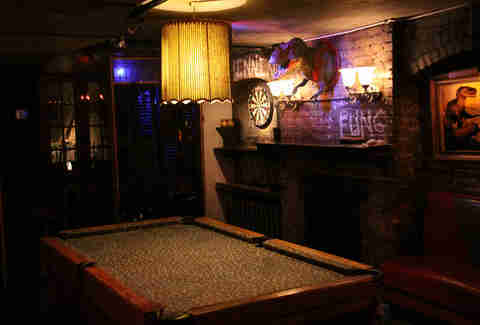 Dark surroundings, a pool table, a dart board, and beer -- what else could you possibly need? 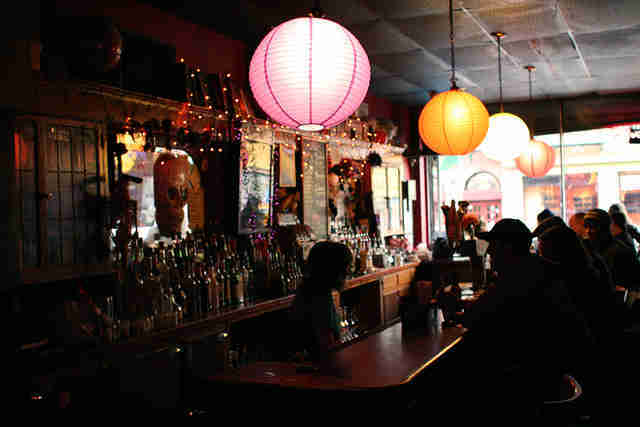 Botanica’s super-dark and intimate, plus it’s got happy hour until 8pm, and a huge space in the back where you will definitely not have cellphone service... which really just allows you to enjoy those $8 Ginger Yum-Yums in peace. 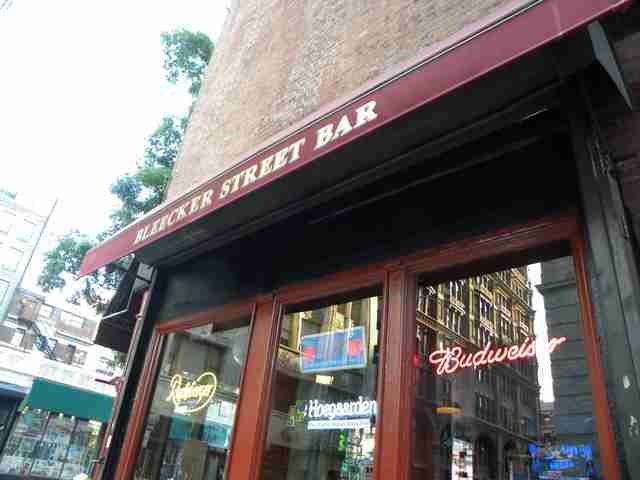 One of the best places to start your night, and it’s conveniently located just outside the Bleecker St subway stop! This dive’s got tons of space, good beer, darts, pool tables, and TVs. It’s a bit dusty and dingy, but Grassroots delivers dive bar excellence with a classic tin ceiling, loads of on-tap brews, and bowls of popcorn for just $1. 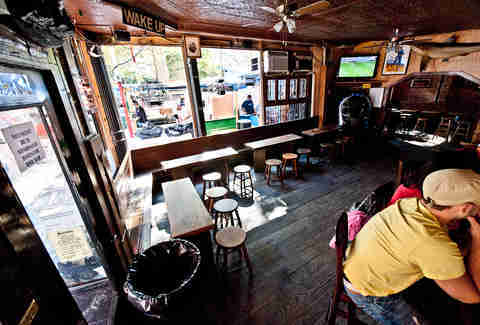 A Philadelphia bar with the obnoxious fans to prove it, Wogies does its home-city right with reasonably priced booze, unparalleled Philly cheesesteaks, and killer subs like the Atomic Avalanche (steak, American cheese, pepperoni, hot peppers, fried mozzarella bars, and marinara sauce). duckduck has this incredible ability go from a cute after-work drink spot to a bustling 2am dance party. It’s the perfect place to end your night in Williamsburg, with dart boards, mismatched vintage furniture, cheap beer/shot combos, and an always-great selection of ‘90s hip-hop. Margaritas in giant Styrofoam cups! Now THAT is living, my friend. This honky-tonk dive with an impressive display of “lost” bras has only female bartenders, a country-blaring jukebox, and pitchers of Pabst for only $8. Owned and operated by it’s namesake, Ludwika “Lucy” Mickevicius, this ABC bar is a local favorite for canned beers and pool. 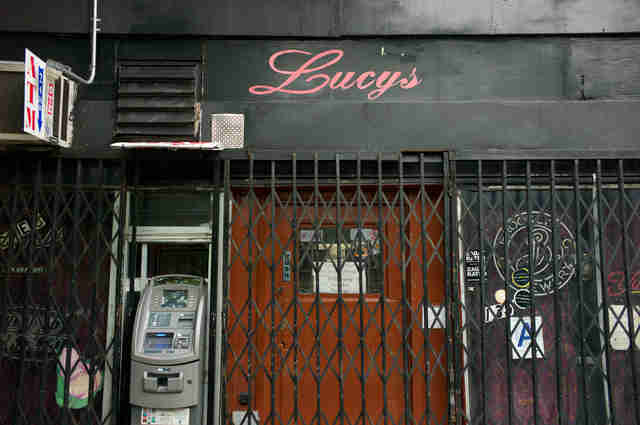 Hours can be erratic, but with Lucy herself (now in her 70s) opening and bartending the joint herself, it’s still worth checking out. A Williamsburg honky-tonk dive with free live music and a crazy frozen coffee drink (named Uncle Willie’s Frozen Coffee -- after Willie Nelson, of course). It’s like a coffee slushy with bourbon and brandy in a to-go coffee cup for six bucks. Remember the original Four Loko? This is absolutely nothing like that. It’s amazing. 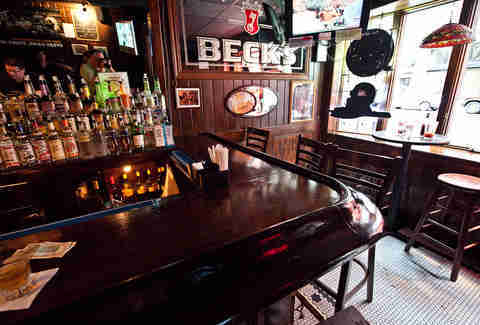 A Tribeca neighborhood classic with cheap drinks, a shuffleboard table, and a highly entertaining, surly bartender. Super tiny, super dirty (again, in a great way), with an excellent beer selection, including lots of German and Belgian brews. Dirt cheap cocktails in enormous goblet-size glasses. Loud metal music from the jukebox. A sizable backyard. Plus, it’s owned by the same guys as Skinny Dennis, so you can get a “coffee thing” here too! Christine Fischer is a freelance writer for Thrillist who spends an offensive amount of time in dive bars. Follow her on her website, Facebook, or Twitter.